When spinning and weaving (or any art or craft) become ritual actions, acts of devotion, acts of magic, the tools of spinning and weaving become ritual tools. I use a Wiccan framework for my religious rituals. I have an athame, a wand, a chalice, a pentacle, a cauldron. I have witch's ladders* and cords and censers and fire bowls and all manner of things. These are all ritual tools. But so are my spindles, distaffs, looms, shuttles, battens, and all the other bits and bobs I use. I've been thinking a lot about my tools lately, mostly because I've been making some. The triangle loom project has stalled out, as I realized that I'm not as competent at woodworking as I thought, and I'm finding it unreasonably difficult to square the damned things. 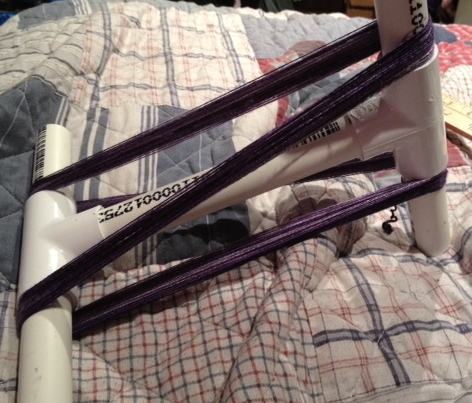 A larger tapestry loom and a warp-weighted loom have been put off while I figure out these things. But I have been making spinning tools. All of my spinning projects right now, and most of them in general, are all very fine yarn or thread, what's known as cobweb weight. Which, of course, always conjures up images of Arachne at her web. 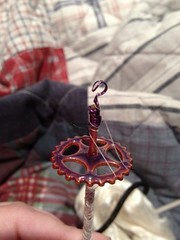 Fine thread requires light spindles, and I've never found drop spindles light enough for me. Even commercially-made featherweight spindles run 12-17g, and that will snap some of these threads far more often than I like. Spinners are generally encouraged, or at least I was, to spine very fine stuff on small support spindles. And I certainly do use support spindles for some things. But I really prefer drop spindles. I like the feel of it, I like the tension, I find it makes it easier to keep a consistent weight to the thread, and I think it looks pretty. It makes me feel good, happy, and in harmony in a way supported spinning does not. 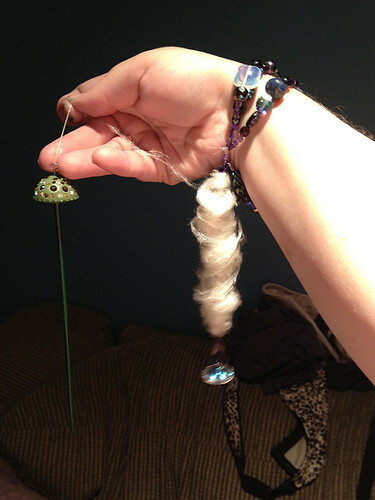 So I have been making my own very light spindles, using supplies from a beading store and bamboo knitting needles. This one weighs only four grams. 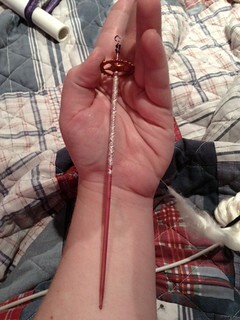 It's made from an enameled copper gear, a bamboo knitting needle, and some purple copper wire; the shaft is painted with purple ink and is coated in resin. I'm spinning white silk top (silk fibers cut in 3" lengths, combed together) on it, very fine indeed. 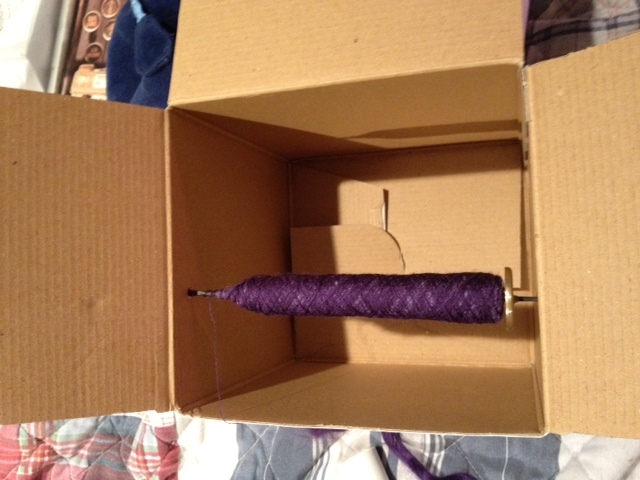 This is going to be plied with thread spun from a painted silk top in blue, indigo, green, aqua, and yellow. I might weave something with it, or send it off to a friend who knits and loves cobweb. 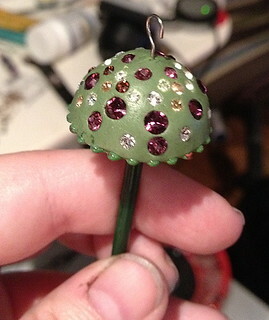 This sparkly thing I just finished. It weighs 10g, is made from another enameled copper gear (this one just a ring shape with no spokes; using it puts extra weight at the outside of the whorl, which gives a better spin), epoxy clay made for setting small crystals in, Swarovski crystals, a steel straight pin, and another knitting needle, again painted with ink and coated. I'm spinning very slightly heavier thread on this, and it's from silk mawatas (warnings: bugs), which, never having been cut, have longer fibers and are stronger, so I can use a heavier spindle. This will be dyed a pale, misty lavender-grey color and sent off to my knitting friend to be turned into a lace shawl so fine it will pass through a wedding ring. One of the other classic tools of spinning is the distaff, a rod that fiber for spinning is wrapped around to keep it both tidy and handy for working from. The tool became so synonymous with women that the female side of a family is still referred to as the "distaff side" today. Personally, I find rod distaffs clumsy to use. I often wrap fiber around my wrist, or tuck it under a hair tie around my wrist. Some times of fiber are easiest to manage wrapped around something, though, so I made what's called a wrist distaff, a bracelet with a dangling part (sometimes rigid, usually not) to wrap the fiber around. 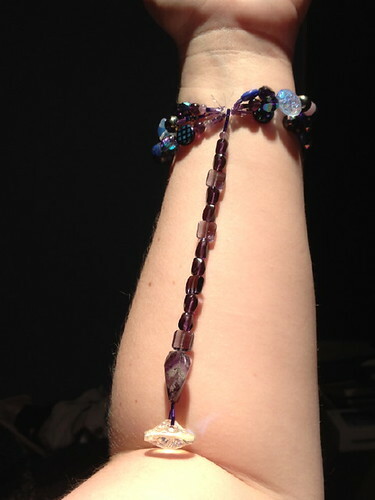 This one is beaded and made from a bunch of things I had lying around, mostly glass and stone, but many spinners just braid some excess yarn into a bracelet, knot it, let the ends hang down long, and put something on the end to weight it. Other tools I've made recently, on the very very cheap, are niddynoddies from pvc pipes and a lazy kate from a cardboard box. The lazy kate is just a box with holes punched in it so it can hold the spindles while I wind off the cop, whether to wind onto the niddynoddy (if I'm finished with it) or to ply it if that's what I'm doing. A niddynoddy is a device for winding skeins on, and these have the added advantage that the yarn can be washed to set the twist and then dried while under tension without even taking the skein off the niddynoddy. The thing about making your own tools, instead of buying them, is that you can put your intention and energy into it from the beginning. You don't have to imbue it after the fact, you can consecrate while you make it. You can make it an extension of yourself, and you can make it specific to your purpose. So the steampunk spindle is made to carry out into the world, and spin there, to be easy and a joy and hardly ever a challenge,which lets me be more aware of what's going on around me, while the bling spindle is made to stay at home and work with a more challenging fiber that takes more care in drafting, something I can focus on more deeply. The sparkle as the whorl turns is pretty hypnotic, really. I use spinning as a form of meditation. It takes just enough concentration that I can focus on it fully, and just little enough that it clears my mind of other distractions, with a little care. The thread I spin on these spindles will be creative, will be transformative. What is made with them will have had power worked into it at almost every stage (not fiber prep; one of these days, cocoons…). And making my own tools only increases that. *I found the concept of witch's ladders in this sense in the Farrar's A Witches' Bible, where it's described as a string of forty beads, used to count off iterations of a chant, prayer, or spoken spell. I used it as a basis to create my own prayer beads, analogous to a rosary, with a simple chanted prayer to be counted off. While writing this, I just had an idea for a fiber-based version that I may have to make now.